About Laurel Lee (Author) : Laurel Lee is a published author of children's books. Published credits of Laurel Lee include God's Greatest Day (My Jesus Pocket Book Series). About Cheryl M. Phillips (Editor) : Cheryl M. Phillips is a published editor of children's books. 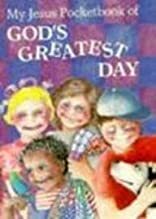 A published credit of Cheryl M. Phillips is God's Greatest Day (My Jesus Pocket Book Series).